Stone skimming, or epostracism, is a game that consists of throwing a shell or flat stone on the water in such a way as to make it bounce along the surface, preferably several times. This game was already played in Ancient Greece, indeed it even formed the subject-matter of an oral treatise explaining how the stones thrown managed to bounce again and again. The fact is that skimming stones has been a popular pastime for thousands of years. To analyses the physics involved in this time- honored human activity, let us focus on the moment the stone bounces on the water’s surface. An angle of approximately 20o between the stone and the water’s surface is ideal throwing condition to get as many bounces as possible. Traditionally, it has been assumed that the stone generates support in the same way as a flying disk, though there is no scientific basis for this explanation. Neither does the surface tension of the water explain the observed behavior. The same author Schlichting, proposes some conditions or requirements for the rebound phenomenon to occur, but does not propose a causal justification: To make such a disc jump, it is necessary to confer, in addition to a straight flight forward, a component of movement up through the interaction with water. This is only possible by means of a suitable force at the moment of impact, on which it will depend that the small slab sinks or bounces with sufficient power. We believe that this is a new case of the bodies subject to multiple rotations. The skim occurs if the stone has intrinsic rotation. The rotation of the stone enables us to deduce a clear example of a rigid body subject to two, non-coaxial rotations: the initial one and the one owing to the resistance of the water at the moment of impact. Figure 12.11. Path resulting from a flat stone with angular intrinsic momentum against a film of water. If a disk, or even a flat stone, is thrown onto a film of water, this will sink, just as if let fall, on account of it being accelerated by the force of gravity. However, if the stone is thrown while at the same time applying a rotational momentum on its vertical axis, surprisingly, the stone skims along the water and continues to advance, until the dissipative forces bring its movement to an end.3 (See figures 12.11 and 12.12). We start from the hypothesis that the throwing resembles the parabola of a projectile. It cannot be assumed, as in the case of the boomerang, that the effective support effect during the movement of the stone through the air is a decisive feature of our analysis. and at an initial angle , while at the same time endowing it with rotation, which makes it turn about its own Z’ axis at a constant angular velocity ω. The parabolic movement will continue until reaching the water surface, at which point something peculiar happens as mentioned above, namely, that the stone, endowed as it is with intrinsic angular momentum, instead of sinking, skims over the water commencing a new, apparently parabolic movement until it falls again; an action that is subsequently repeated until losing its kinetic energy. Figure 12.13. Stone reference frame. On carefully scrutinizing the occurrence, we see that the path of the stone varies after hitting the water. Indeed, it varies to the extent that it changes from a downward trajectory to an upward one, thus acquiring potential energy again and losing its equivalent in kinetic energy. After it hits the water each time, you get a new path similar to that of a projectile, which results from compounding the inertial reaction caused by the instantaneous torque generated in the contact with the water and the translation velocity of the centre of mass of the stone. This path will hold good until the stone, with its intrinsic rotation, touches the water again, the moment at which the dynamic interaction phenomenon makes it bounce upwards once more. 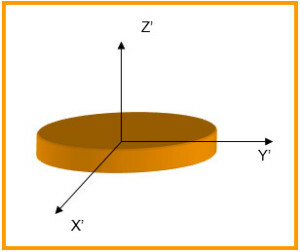 As long as the stone has intrinsic rotation this process will continue whenever it comes into contact with the water, until eventually sinking on account of insufficient angular momentum.5 See figure 12.13, the reference frame for the stone in our analysis. Figure 12.14. Diagram resulting from the hitting of a flat stone with intrinsic angular momentum against a film of water. The reason for this change of path in the stone is, we believe, the action of the instantaneous torque at the stone’s point of contact with the water, constituted by the friction force at that point and its weight. With its intrinsic rotation, the stone comes into contact with the water at a certain inclination of the Z’ axis with respect to the perpendicular of the water surface. The resultant momentum is not null, given that, owing to the reaction of the weight at the support point, a momentum appears that would make the stone rotate with respect to that point. This momentum, which is not coaxial with the corresponding intrinsic rotation of the stone, causes the appearance of a dynamic interaction phenomenon that we will first assume as instantaneous. This torque will cause an internal distribution of velocities that will couple with the linear velocity of the centre of mass giving rise to an upward path. In this case, it must be assumed that the stone will have a certain inclination with respect to the water plane, causing a tangential friction force at the stone’s point of contact with the water, in addition to the force -P of reaction to the weight mg of the stone (Figure 12.14). The body endowed with angular momentum L follows a parabolic path. At an instant t1 it ends its initial trajectory on coming into contact with the water where the aforementioned torque is produced. This torques causes a variation of the angular momentum , which is non-coaxial with L, thus creating the internal distribution of velocities that is coupled with the translation velocity resulting in a variation in the stone’s path. The torque created by the weight and the reaction at the support point represents a momentum with respect to the centre of mass, which would generate a new rotation with respect to the X’ axis of the frame of reference of the body. Owing to the existence of a prior, non-coaxial rotation with respect to the Z’ axis, and in accordance with the underpinning theory, the dynamic interaction determines the appearance of a non-homogeneous distribution of resultant velocities which could be understood as a dynamic interaction torque perpendicular to the weight force, the dynamic momentum of which goes in the X’ axis direction. This non- homogeneous distribution of velocities is coupled with the translation velocity vector making the stone vary its direction, i.e. it generates a rotation in the direction of the vector, in which the axis of this rotation is perpendicular to the motion plane. See stone skimming illustration in figure 12.15. Figure 12.15. Epostracism or Stone skimming: the stone rotates on an axis that is perpendicular to the water surface. This being the new velocity of the centre of mass of the stone, which incorporates an upward path vector as the stone begins its new parabolic motion. angular momentum to perform the next bounce. In reality, the dissipative forces such as friction with the air and water, make the stone gradually lose both its linear and rotary velocity, eventually reaching a moment in which the rotational inertia does not suffice, thus leading the stone to sink. Based on the dynamic phenomenon we have just described, bouncing bombs were specifically designed in the World War II to blow up water reservoir dams. Figure 12.16. Bouncing bomb dropped against a water dam. Let us imagine a barrel that is dropped from an aeroplane onto reservoir created by means of a dam. Our barrel travels inside the aircraft, the hatches of which are opened at particular moment, as a type of ramp on which the barrel starts to roll owing to the action of gravity. After coming off the hatch ramp, it begins a movement composed of a fall and another horizontal movement at the speed of the plane, i.e. a downward parabolic path. The barrel, on rolling along the aircraft ramp, is launched at an initial dextrorotation rotational velocity of ω, as per figures 12.16 and 17. Moreover, in accordance with Newton’s first law, it will continue to move at the initial velocity V1 which is that of the carrier aircraft. On hitting the water surface, the barrel will bounce, as does the stone, thus beginning a new upward movement until exhausting its potential energy, the very moment at which it will begin a downward path towards the lake surface. It will continue to move thus until reaching the dam, where it will drop, rolling down along the dam wall. In World War II bouncing bombs were designed on the basis of this phenomenon to attack water reservoirs. The bombs were launched from low-flying aircraft to destroy the dams and its retaining walls.. They were rotating, cylindrical bombs with a high rotation velocity, which were launched from the low-flying aircraft from the tail of the reservoir towards the retaining wall. The cylinder was made to roll inside the aircraft along the ramp from which it was launched, with its axis of symmetry parallel to the water surface. Experimentally, it would have been confirmed that the bomb bounced along the reservoir water in the same way as a flat stone when we throw it rotating about its vertical axis onto the flat surface of a lake or river. On reaching the wall, owing to its high rotation speed and its weight, it sinks, rolling down along the wall or, on account of its weight, a delayed firing device would make it explode at sufficient depth, thus causing serious damage to the wall. A selective projectile was achieved with a high performance rate, effectively destroying the dam or wall, even if the bomb exploded at a distance from it. Nowadays, such a projectile would be called a smart one, albeit really not having any electronic tracking device. 7 (See figures 12.16 and 17). Figure 12.18. Cylinder reference system. As a theoretical explanation of this behavior, the author alludes to the concept of the: “hydrodynamic spring”, a phenomenon that cannot be integrated into physics and which would contravene Pascal’s Law. The behavior of this device is easy to explain by means of a dynamic analysis of the phenomenon, in accordance with its underpinning theory, showing why the heavy bomb does not sink on its first contact with the water and, on account of having its own rotation, continues on its bouncing path until coming up against the wall and sinking. Any dynamic analysis of these bombs can begin by using the hypotheses of its underpinning theory. Once again, the effects of air friction are discarded. height at an initial linear velocity , which was that of the carrier aircraft. The path taken by the barrel, as we have indicated above, would be that of a downward parabola, until reaching the lake surface, the moment at which the phenomenon under study occurs, namely, instead of sinking, the barrel is thrust upwards, altering its path, while at the same time continuing its translation motion. Its initial translation and intrinsic rotation velocities will have been reduced owing to the crash against the water. At the moment of coming into contact with the water, a resistance or instantaneous friction force will be caused that generates a deceleration at this point, pivoting the cylinder about the point of contact. The device, as is the case with skimming stones, is endowed with angular momentum, given its rotation, and with linear velocity, nonetheless, at the moment of coming into contact with the water, a new instantaneous momentum appears, which, in accordance with TDI, causes a precession movement, making the direction of its translation velocity change by means of a turn  with respect to the X’ axis of the body, thus initiating an upwards path until the potential energy acquired exceeds its kinetic energy. At that very moment the cylinder will once again initiate a falling parabolic path, and so on successively until reaching the reservoir dam, where it will fall rolling along the wall until exploding by means of a pressure firing device (See figures 12.16 and 17). Figure 12.19. The dynamic interaction effect produces an upward precession path. The lack of a constant torque will prevent the precession movement initiated making a complete orbit, but at the very moment of crashing against the water, the weight and friction force will produce a torque. By applying the concept of dynamic interaction, it can be seen that the combined effect of the forces of weight and instantaneous friction produce a non-coaxial torque with the angular momentum of the cylinder, which makes the rotating object lift (Figure 12.19). Paradoxically, the path is an alternative movement, with a component of precession that is produced at the moment the cylinder crashes against the water, lifting the device and seeing it fall once again when the potential energy it has acquired equals the kinetic energy. This action will be repeated as long as the device continues to rotate or until coming up against the retaining wall. 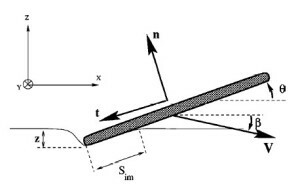 The friction force and the weight act as a non-coaxial torque with the angular momentum (Figure 12.20). The cylinder’s initial angular rotation velocity will tend to reduce the friction force, however, at the same time, it produces a twist in the rotation axis, thus creating the distributions of velocities and accelerations that characterise dynamic interaction, but which, in this case also, is practically instantaneous. Figure 12.20. Diagram of momenta and forces. Figure 12.21. Illustration of the different cylinder movements. They are, therefore, bombs the dynamic behavior of which is explained with the same argument as we have used with respect to skimming stones within the conceptual framework of the Theory of Dynamic Interactions. Section 7.5 above already contains a reference to this interesting dynamic phenomenon. This is a paradigmatic example of the theory being put forward. On simultaneously subjecting a cylinder at rest, which is supported by a generator on a flat surface, to a rotation that enables it to roll and to another on a vertical axis, while at the same time giving it a certain thrust, the cylinder will lift. Indeed, it is even possible to make the cylinder lift at one of its sides and end up at rest on a side face, in a stable position on a flat surface. (See figure 12.21). Figure 12.22. Distribution of the specific velocities of the particles at a distance R from the axis of symmetry. If we empty a soft drink can and rest it on the ground, but not on its base, rather on a generator and move it symmetrically with the finger, in such a way that it rotates with respect to its main axis of symmetry and, at the same time, on another vertical, perpendicular to the former, at the same time as the can is driven to roll forward we see that, if we have done so with a certain dexterity, the can will also begin a rotation movement about a new horizontal axis, perpendicular the foregoing ones, the final result of which will be the lifting of the can, even to the extent of having it stand up, i.e. standing upright on the ground on one of its bases. pushing it forward with a linear velocity . All of these are constant velocities. Figure 12.23. Distribution of the accelerations of the particles. We observe the momentum of the quantity of movement of the cylinder particles, to which end we take the section corresponding to the cylinder’s centre of mass. 1. Linear, on account of the impulse , located at the centre of mass. 2. Rotational with respect to the Z axis: ω. 3. Rotational with respect to the Y: θ. When the movements are exclusively the result of the first and second ω, the kinetic energy and the linear momentum of the system on each one of the particles of its mass are conserved. However, when the second rotation θ comes into action, the distribution of the velocities of the particles no longer remains constant, on the contrary: it is variable (See figure 12.22). The appearance of a field of variable velocities means the appearance of accelerations and, therefore, the appearance of forces proportional to those accelerations (See figure 12.23). By representing the effect of the second rotation on the centre of mass section, we can see the distribution of the velocities of the particles at a distance R from the said centre of mass. The acceleration of each particle is determined by the derivative of the velocity with respect to time. At this juncture, we should recall the cosine character of the specific velocity and the sine character of its acceleration, as corresponds to the derivative that is one of the other. The new distribution of resultant velocities, which appeared owing to the effect of the new twist to which the cylinder with intrinsic rotation is subject, is coupled with the linear velocity of the centre of mass, thus modifying its direction but not its module. The new path of the centre of mass would be found on the plane formed by the initial velocity and the second momentum applied, in this case the rotation with respect to the Y axis. The movement seen is opposite to the action of the weight on the cylinder, the tendency of which would be to fall. the angular momentum of which to its Z’ axis of symmetry is , and non-coaxial with respect to its vertical Y’ axis and a linear velocity with respect to the body’s frame of reference. According to our dynamic model, the behavior is that which results from the Dynamic Interaction phenomenon that is caused (See figure 12.24), and the effect of which is to couple the new resultant velocity of each particle to the translation vector velocity of the body, represented by the velocity vector of the center of mass, thus making it change its path, but not its module. The result would be equivalent to the action of a central force acting on the cylinder’s center of mass. Figure 12.24. Illustration of the reaction of the dynamic interaction. As can be seen, the new velocity has a new component on the Y’ axis, which is responsible for the cylinder tending to lift onto its round base. The initial thrust is practically instantaneous, the evolution in time to obtain the complete trajectory of the centre of mass is initially determined by α, on being a variable function of time, but this function has two different phases, the first, which is practically instantaneous, corresponds to the lapse of time of the application of the external torque. However, a new torque is then maintained, owing to the weight and the resistance of the point of support of its edge. The velocity direction variation is such that it rotates on the plane that is formed with the axis of the second rotation, making the path of the centre of mass rise on that plane. Obviously, that plane is fixed with respect to the body’s frame of reference, but moving with respect to a system of fixed axes and the exterior of the body, containing the final trajectory of the centre of mass. Owing to the distribution of the accelerations generated by the second rotation, the cylinder begins to lift, which gives rise to the circumference of the base having a point of contact with the ground, a bond, with the edge of the side base of the cylinder starting a rotation movement about the ground plane. The cylinder that continues rotating with respect to its main axis of symmetry, pivots and rolls over this point of contact, while at the same time the cylinder continues to lift on account of the action of the distribution of accelerations until achieving compete verticality. In this case, unlike the skimming stone or the bouncing bomb, the second rotation is not instantaneous, rather it is caused at the outset by an external action, but it is subsequently kept up throughout the process by the spinning effect, until such time as the dissipative forces of friction prevent it, etc. As long as this spinning lasts on the side edge of the can, a constant spatial modification of the angular momentum is caused that is non- coaxial with the main one. An experimental test requires the modulation of the actions applied. Depending on the rotation velocities acquired by the cylinder, it will begin to lift as if a torque were acting on it in the indicated direction, and if we raise our initial torque to certain values, it is possible that the cylinder achieve verticality with respect one of its bases, thus accomplishing our goal. This same phenomenon is produced in a foot activated spinning top model. In this case we are dealing with a toy that on being activated, subject to a rotation on its main axis simultaneously with a rotation on its vertical axis, we will manage to get it to lift and start its normal rotation and precession movement. It should be pointed out that the lifting reaction that the spinning top undergoes owing to the dynamic interaction contravenes the laws of classical mechanics. All of these toys can be recreated in the laboratory to analyze the peculiar behavior of bodies endowed with angular momentum. These cases cannot be resolved by classical mechanics, pursuant to which some teachers of dynamics claim that the cylinder is lifted owing to the reaction effect of the support! An absurd claim that merely confuses the reaction of the support to the weight with an external force “imposed” on the body.